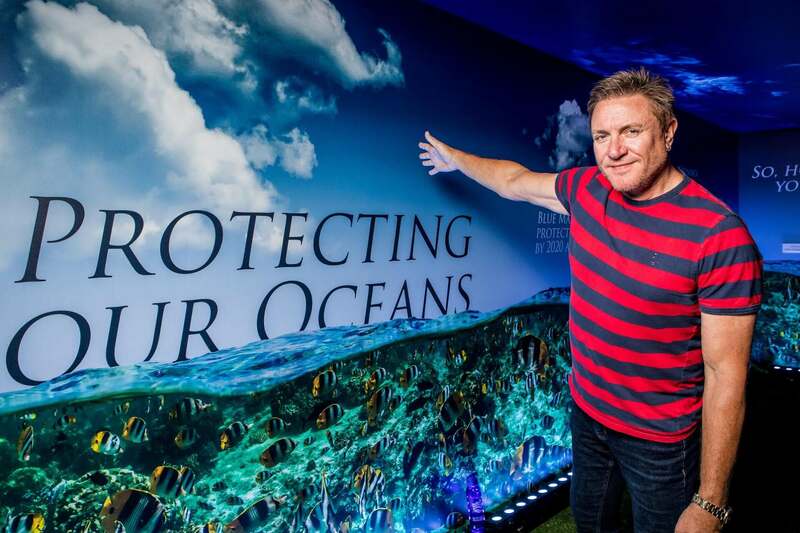 Lead singer of the iconic British band Duran Duran, Simon Le Bon, was a special guest at this year’s 50th anniversary Southampton Boat Show where he took to the Sunseeker stage to highlight the importance of protecting the marine environment for future generations. Simon, a long-serving ambassador of The Blue Marine Foundation (BLUE), officially opened the Sunseeker stand and BLUE exhibition space. The exhibition, which is located on the stand, highlights the problems we currently face globally and while at the show Simon spoke passionately about the increased pressure we are facing from unregulated fishing, tourism and pollution. Since 2017, Sunseeker has partnered with BLUE and has recently launched its first campaign titled ‘Project Menorca’, an exciting marine conservation programme that will focus on improving and protecting the island’s marine environment. Simon, who arrived at the show, on board a Sunseeker yacht, is extremely passionate about raising awareness of the damaging effects that overfishing and the destruction of biodiversity can have on the world’s oceans, and took part in the Whitbread Round the World Race in 1985. Since becoming an ambassador for BLUE, Simon has launched fundraising initiatives, including a charity bike ride from London to Monaco, spoken on behalf of the charity at several events and carried out interviews highlighting the work of the charity. Simon commented: “The sea is a beautiful thing. We all grew up thinking it was perfect, pristine, and it would always stay that way. However, now we’re starting to see the reality of humanity’s impact on the world’s waters. It is a disaster unfolding before our eyes. For more information on Sunseeker’s partnership with BLUE, its launch of ‘Project Menorca’ and how you can help the cause, visit: www.sunseeker.com/blue. Sunseeker is the world’s leading brand for luxury performance motor yachts and Britain’s biggest boat builder. Originally named Poole Power Boats, the company was founded by brothers Robert and John Braithwaite in 1969. The company changed its name to Sunseeker International in 1985 and has since become a global icon, with every Sunseeker the result of an uncompromising and unmatched approach to design, craftsmanship and performance. In August 2013 a majority stake in the business was acquired by Wanda Group, the Beijing headquartered conglomerate with strong footprints across China, Europe and the US. Wanda Group is a committed long-term shareholder providing strong financial and strategic backing for Sunseeker’s continued growth and success. From its manufacturing base in Dorset on the south coast of England, Sunseeker employs c.2,500 people and produces around 150 boats every year ranging from 50-131 feet. As a prominent business within the county and one of Dorset’s largest employers, Sunseeker wanted to work with a charity that could resonate with its employees, who have now raised approximately £77,000 for Macmillan Cancer Support. Most recently Sunseeker announced a long-term partnership with the Blue Marine Foundation a charity dedicated to creating marine reserves around the world and improving biodiversity. With the future of healthy seas and oceans at risk, Sunseeker has launched its first campaign titled ‘Project Menorca’ which will focus on the island’s marine environment. Working closely with BLUE, the new partnership will establish a recognised model of conservation, supported by local partners on the island including the Menorca Preservation Fund. Demand for the company’s larger models continues to grow year-on-year with more than 125 yachts over 100 feet in length already delivered. Buyers have benefitted from the company’s ‘Bespoke’ customisation service which allows individual customers to personalise their yacht. Working very closely with highly professional dealer representation in over 74 countries, service and product support is a key priority in maintaining customer satisfaction. The Sunseeker range constantly sets new standards and benchmarks. From the dynamic Sport Yacht models, through its luxurious Manhattan range, iconic Predator models and its majestic Yachts range, each Sunseeker is the result of an uncompromising approach to innovative design and engineering excellence. Never settling for second best, it is this spirit of excellence that has driven Sunseeker to its pre-eminent position in the leisure marine industry today.